You knew it was coming. Next on the_browser: Burlington bakery/social media denizen August First. August First proprietress Jodi Whalen stops by for a chat about how they’ve used social media to launch their new business. Jodi just happens to have a background in marketing so she gives some great insights into how tools, like Twitter, can be used to cultivate community around… Tomato Soup? Yup. Listen at 6pm on 105.9fm womm-lp in Burlington, VT, and streaming online at TheRadiator.org. 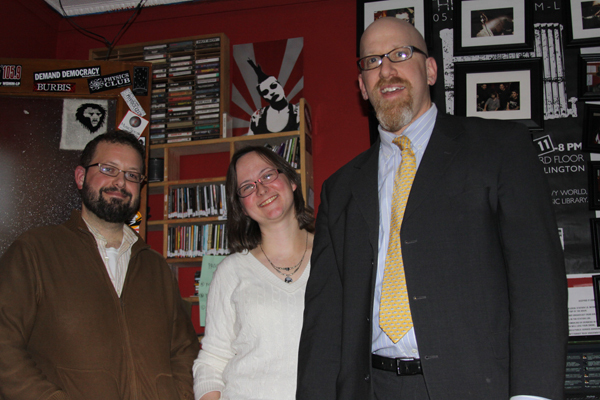 Next on the_browser my guests are Burlington City Councilor Ed Adrian and Seven Days Associate Publisher Cathy Resmer. The topic: Tweeting city council meetings. Councilor Adrian is active on Twitter (see @counciloradrian) and Cathy Resmer (@cresmer) is one a few folks who live-Tweet the Winooski City Council Meetings. They join me live in The Radiator studios to talk about their use of Twitter in general as well as Tweetin’ town meetings. What’s the benefit? Are there drawbacks? What have their experiences been? Got a question? Pre-Tweet it and mention my Twitter handle, @jonathanpb the hashtag #wommlp. Do you have really strong opinions and want to join us in the studio? Contact me (my Gmail is the same as my Twitter). Listen Wednesday at 6pm on TheRadiator.org. Our chat, and a pic.